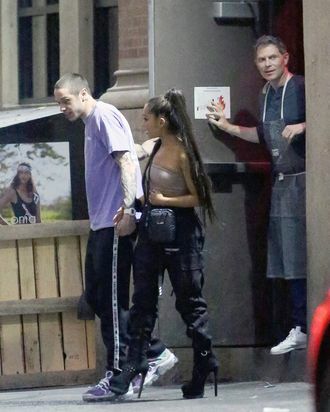 Here’s Ariana Grande, Pete Davidson and … Bobby Flay? Pete Davidson, Ariana Grande, and Bobby Flay. Ariana Grande and Pete Davidson’s relationship continues to move at lightning speed: they’ve become engaged, even more tattooed, and moved in together in the span of a few weeks. But now, the Harry Potter fans have apparently taken things to the next level — by having their first paparazzi picture taken with celebrity chef . Per the , the couple — celebrity name Grandson or Pariana, depending on who you’re talking to — went out to dinner in New York City on Tuesday night at , a Mediterranean restaurant owned by Flay. After their meal, Grandson (which is my preference, FYI) was led out the back by Flay, at which point they were captured in the most random but also perfect paparazzi pic we didn’t know we needed. Excuse me while I frame this pic. Here’s Ariana Grande, Pete Davidson, and … Bobby Flay?